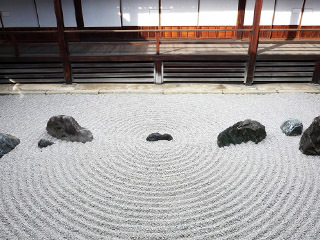 This art includes both Japanese culture and Japanese aesthetics. It can be said to be one of the compile of Japanese art. 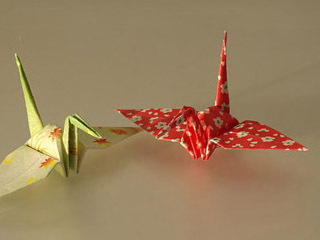 You may easily understand there is some sort of relationship between Origami and Orange Origami art. However, Orange Origami is inspired with the opposite ideas. That is, a flat art work is created out of a sphere. In Origami, though, a three-dimensional shape is created out of a flat square paper. What is the common point between Orange Origami and Origami? It is that in both cases, art works are created within the restriction. Origami is different from other types of paper craft in that only one square paper is used to make an art work without cutting or adding anything. That means that there is a considerable amount of restriction in creating art works. In spite of that, there are amazing kinds of various artworks created by Origami. Seeking the efficiency and the beauty within the restriction can be often seen in Japanese plastic arts. Japanese electric appliances are well known as compact and efficient. But this type of thing has not happened suddenly in these days but it has been cultivated through out the years with the passion of designing within the limitation. What can be seen often in Kyoto is that the people try not to waste any little space but to make use of all the space. This craft called ' tangerine peeling art - Mikamuki-' is also done with a simple rule which is to peel just one tangerine without adding or removing any part from it. Therefore, it is impossible to change the shapes as you please. If you want to remove a certain part, that part has to be used in another place. It seems there is a similarity with a law of conservation of mass! That is how you create a shape considering the other parts of the tangerine, then you may seek 'harmony 'with the surroundings. 'Coincidence' is also an important factor to reach that shape, but at the same time, it is also 'inevitable' to use that design in order to reach a certain shape out of a round tangerine. The creation is done through seeking harmony with the rest of the parts without insisting on its own part too much. That shape may be different from the first design you may have had, but the result of the creation through 'harmony' is more attractive than it was intended at first. To give a value to the peel of a tangerine which was supposed to be just thrown away into the trash can seems to have something to do with the heart of the Japanese who have the value of 'mottainai' -too good to be wasted. This is a creation of art through making something within a restriction, seeking harmony, simply beauty of creation. 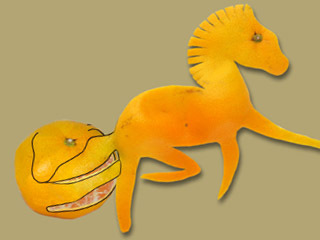 'Tangerine peeling art' called 'Mikamuki' in Japanese with a most traditional fruit - tangerines- is a very Japanese art. I hope that this art may be the beginning of a Japanese new traditional culture from now on. Mottainai (Wikipedia) Mikamuki = Abribiation of "Mikan muku" that means peeling tangerine in japanese words.